The Interim Budget 2019-20 was nothing short of a last-minute surprise for the real estate sector. While a lot of prime demands of the real estate industry went unmentioned, there were multiple tax sops introduced for the tenant community and second homeowners. Developers’ challenges in the form of notional rent paid on unsold inventory, too, were given a relief by increasing the limit from one year to two years. Giving a boost to affordable housing, Finance Minister Piyush Goyal extended the benefits of Section 81BA. With much-to-offer, but yet insufficient to meet the prevalent challenges of the real estate sector, the Interim Budget 2019-20 has been a mixed bag. We, at CREDAI, laud the Finance Minister and the Government for instigating progressive and dynamic reforms at the 2019 Union Budget which will provide a boost to not just the Indian real estate sector but also the entire economy. The decision to reduce the GST burden on homebuyers is extremely encouraging while other significant moves such as relieving second houses from income tax on notional rent and exempting second homes investment from capital gains will provide a fillip to the entire sector by enhancing demand for housing in India. Additionally, allowing two years’ exemption from notional rent on unsold inventory is another step in the right direction. CREDAI shares the Government’s ambition of ‘Vision 2030’ and is determined to contribute substantially to establish a New India in the coming years by ushering an era of unceasing growth for the entire country. In terms of real estate, we believe that the benefits under Sec 80(i)BA being extended for one more year, for all housing projects approved till end of 2019-2020, and benefit of rollover of capital gains tax to be increased from investment in one residential house to that in two residential houses, for a taxpayer having capital gains up to Rs 2 crore; which can be exercised once in a lifetime are the biggest takeaways from this year’s budget. Additionally, existing homebuyers income tax relief on Notional Rent from unsold houses has now been extended to 2 years, along with increase in TDS threshold on rental income raised from Rs 1,80,000 to Rs 2,40,000. In general, we would like to congratulate the Finance Minister for a wholesome balanced budget. We believe that the move to increase income tax slab to Rs 5,00,000 is a very positive move. This is a helpful step towards increasing disposable income for a first-time buyer planning to purchase a real estate asset. We also look forward to the outcome of Group of Ministers examining how prospective housebuyers can benefit under GST, which we believe should not only benefit them on paper but practically as well. At the same time we would have preferred a Single Window clearance for all real estate projects, just like the ones extended for Movie Industry, and increase in exemption on interest on home loan to at least Rs 5,00,000 per annum. 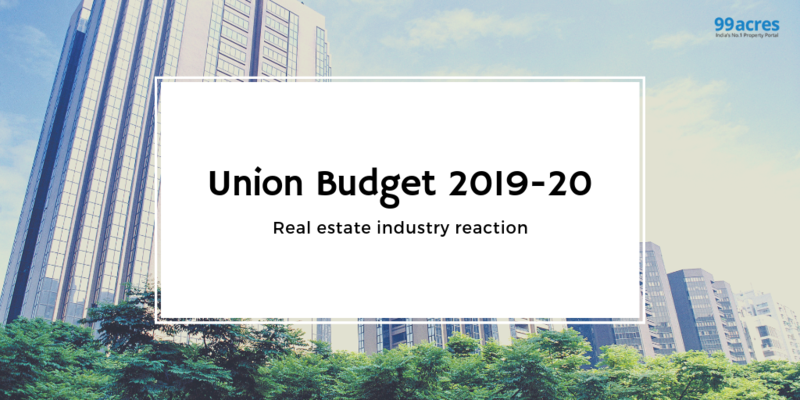 Interim Union Budget 2019 augurs well for the real estate sector. Tax proposals aiming to increase the disposable income for individual tax payers and allowing rollover of capital gains benefit of up to Rs 2 crore for reinvestment in two residential houses, should have a positive impact, especially for potential homebuyers. Extension of tax holiday benefit for affordable housing projects by another year and extension of notional taxation for unsold inventory from one year to two years are welcome moves and will improve the overall sentiment for the sector. This budget has given the right push to the affordable housing sector and the growth witnessed in the last year would continue unabated. As families continue to expand, exemption of tax on notional rent for second self-occupied house will further push affordable and mid-income housing in the country. We will now see more new launches by well-established and fundamentally strong developers in the affordable segment to reap in the benefits of Section 80-IBA as well. This is a positive feel good budget which was expected, given the General Elections 2019. It is extremely positive for the affordable housing sector and reinforced the Governments' continuing commitment to this important sector. Enhancing the ease of living and consolidating the real estate sector will further provide people with a comprehensive social security and strengthen the government's vision to make India a $10 trillion economy. The direct and indirect benefits of the Interim Budget 2019 are likely to bring a profound change in the demand and supply economics of the real estate industry. Since affordable housing is the need of the hour, extending the benefits under Section 80-IBA of the Income Tax Act for one more year will surely lead to a rise in end-use consumption of homes. Also, with inflation at an all-time low and the announcements on income tax rebate schemes, home buying sentiment will receive an impetus in the country. Secondly, extension on period of exemption from levy of tax on notional rent, on unsold inventory from one year to two years, is a welcome move for the builder community. This Budget, ahead of the Election, looks like a balanced and inclusive one with thrusting growth and enhancing consumption at its centre. With the levy of 12 percent GST on construction services, the real estate sector is facing a significant constraint as to the sale of under-construction property. Recognising this issue and with a view to mitigate the same, the GST Council has formed a special committee, based on the recommendation of which it is expected that the GST rate on under-construction property will be reduced. However, the issue faced by the real estate sector has resulted in huge unsold inventory in the hands of the real estate developers. Under the Income Tax act, any inventory lying unsold beyond a year attracts notional rent on which income tax is payable by the developer. The proposed amendment seeks to extend the period beyond which income tax on notional rent will be payable from one year to two years. This is surely a welcome move for the real estate sector, specially at this stage. The positive vibes of this Interim Budget will undoubtedly manifest itself positively with time. The rebates for individual tax-payers, increase in the standard deduction and the TDS threshold for rental income, benefit of rollover of capital tax gains, and exemption of tax on the second self-occupied home, will play a significant role in positively influencing the buyer sentiment. We hope that this results in an increase in the real estate sales and nudge the fence sitters. Appointment of a group of ministers to reduce the GST burden on the homebuyers, removal of tax on notional rent for the second home, and extension of period pertinent to tax exemption on notional rent for unsold inventory are all welcoming steps. Further, revision in the income tax slab is also expected to benefit the homebuyers significantly. The easing of the notional rent is a big relief from the challenge that has been haunting the developers from quite some time now. We welcome the move immensely. The housing for all motive is evident from the affordable housing impetus, which is again a piece of wonderful news. Relaxation in the capital gains and TDS relaxation are all measures to remove the government hindrances in property transactions. Undoubtedly, the real estate sector will witness a steady revival in the days to come. The real estate sector welcomes the Government’s decision to appoint a group of ministers to examine and make recommendations in reducing the burden of GST on homebuyers. This will definitely boost the confidence among the homebuyers. Also, the decision to extend the benefits to the housing projects (approved till 31st March 2020) for one more year, to make more homes available under affordable housing will certainly give great impetus to the realty sector. As compared to the previous few years, this budget has offered quite a lot of incentives to the homebuyers and other stakeholders in the real estate sector. Among the highlights include tax exemption on notional rent on the second house, increase in TDS threshold on rental income from Rs 1,80,000 to Rs 2,40,000 and extending the benefits of rollover of capital tax gains from investment in one residential house to two residential houses. We are hopeful that all these measures will give way for a new beginning in the housing market, in a way that is both sustainable and economical. Given this is a pre-election budget, it garners more attention than the other years. Further, being a taxpayer-friendly budget, it also has raised hopes. While there were many proposals aimed at boosting the infrastructure, re-instating standard deduction was probably the most notable benefit for the salaried class. Exemption of TDS on rented properties up to Rs 2,40,000 per annum is also a favourable move for the common man. This can propel demand from the investors. Allocation of Rs 19, 000 crores in the Budget 2019 towards Pradhan Mantri Gram Sadak Yojana is also a welcoming move as it is a necessity for the country to remain firmly on the path of development. The relief on notional tax on unsold properties and benefits under section 80 will also help the developers, given the present industry consolidation post-RERA. The income tax support schemes will further increase the disposable income and the purchasing power of the potential homebuyers. Ashish R Puravankara, Managing Director, Puravankara Ltd. The Interim Budget has brought cheers for the taxpayers and we welcome this move. The benefit of rollover of capital gains from investment in one residential house to two residential houses will help the homebuyers in fulfilling their dreams of purchasing a second home. Further, the proposal to exempt levy of tax on notional rent if a buyer has more than one-self occupied house will act as an added bonus for the property owners, thereby increasing their liquidity and purchasing power. From an industry perspective, there is some relief via extension of tax levy on notional rent for unsold inventories, from one year to two years. An assurance from the Government that the GST Council is seeking recommendations from a group of ministers on GST applicable on purchase of homes is also heartening. In overall, this Interim Budget has put some extra cash in the citizen’s pocket, which in turn will increase their spending power and strengthen the economy. Interim Union Budget 2019-20 will ensure an all-round growth of the economy and boost the nation’s GDP. The tax amendments taken to reduce the burden on the middle-class taxpayer by providing a full income tax rebate for citizens earning up to Rs 5 lakh per annum will make the home buying easy especially for first-time homebuyers. Additionally, the extension of one year on income tax on notional rent from unsold houses and no tax on notional rent on the second self-occupied house is a positive step for the residential segment of the real estate. Infrastructure development, a key factor in the growth of real estate has been given significant importance. The proposed budgeted expenses in various sectors - Agriculture, Health, Infrastructure, and Entertainment will have a positive impact on the economy allowing us to be optimistic about the real estate market and we look forward to a productive year. The Interim Union Budget has provided a fillip to both home buyers as well as developers. To developers, the benefits under section 80-IBA of the IT Act with profit gains getting a 100 percent deduction being extended for another year will encourage the building of affordable homes. From a buyer perspective, homebuyers can now buy two separate properties to avail of Long-Term Capital Gains Tax exemption on the sale of existing property and now two homes can be owned tax-free. Further, with TDS only being deducted when rent crosses Rs 2.4 lakh per annum will further enhance real estate as an investment opportunity.